Loading docks are the lifeline for your commercial warehouse operation. Any interruption to the flow of goods to and from your building will cost you time and lost revenue. You probably already know that your loading dock consists of several different parts and mechanical systems working in unison to ensure you can easily load and unload cargo from your transports. DoorTech Industries is a locally owned and operated Vancouver company that specializes in loading dock systems and services for commercial operations. With more than 35 years experience serving and installing loading dock systems we can provide you with solutions that will be reliable and help keep the flow of goods moving through your building. Wheel Chock Kits, Strip Curtains and More. 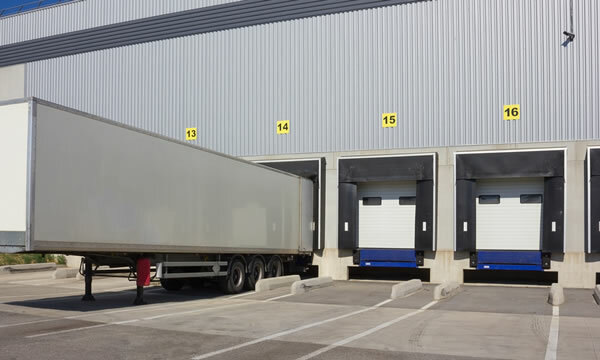 There are many different types of systems involved with a loading dock from rolling high speed door systems, to truck restraints and bumpers, to dock levelers that can bridge the dangerous (often uneven) gap between the transport and your building. Safety, efficiency and reliability are three very important factors when it comes to your loading dock systems and DoorTech Industries can make sure everything is running smoothly for you and keeping your employees safe and your transports happy. Has your loading dock been damaged, or had a mechanical failure with your dock leveler or a high speed door? DoorTech Industries can immediately dispatch one of several of our fully equipped service trucks to your location 24 hours per day. Our licensed and insured technicians are highly experienced with loading dock systems and our trucks are fully equipped with all of the tooling and parts needed to service your loading dock. If you need loading dock repairs right now then call DoorTech Industries 604-315-3667 or fill out or online form for immediate assistance.